In simpler terms we can define Knockoutjs binding as a mechanism to establish relationship between view and ViewModel. View takes user action and pass the instruction to ViewModel. One of the most popular example of this could be clicking on a button or selection of an item on the View by user. After each action of user, view got the task to instruct ViewModel about the same. This is done through the BINDING. On the other hand we can define binding as manipulating DOM elements and their appearance on the basis of ViewModel properties. Binding establish the relationship between View and ViewModel. Controlling User Actions like Click, Submit etc. Now one by one let us take a look on different text control and appearance binding. 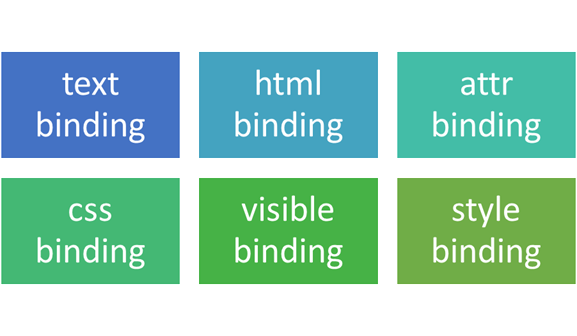 You use visible binding to find when an element on DOM should be visible or when it should not be. This binding is very simple to use. Some points about visible binding is worth discussing here, If value of ViewModel property will resolved to following values then bind DOM element view property will be set to block. 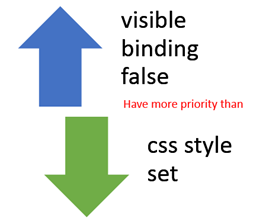 For DOM elements if ViewModel property value is yielding to false then visible binding will always have more priority than CSS attributes. Practically you can do text binding with any element on View. message : "hey welcome to KO "
If ViewModel property contains a HTML encoded value and you bind that property on View using text binding. You use HTML binding to set InnerHtml property of View’s Elements. So let us take a ViewModel with property value encoded HTML value. Now View will render html from ViewModel. Html binding always set innerHtml attribute of Element and text binding set innerText property. You should be cognizant using html binding because it may cause potential injection of script on the view. On basis of ViewModel property messagelevel we need to apply a css class dynamically. To do this a computed observable is required. Computed observable will return css class. In this post we learn various binding which help to control text and appearance of elements. I hope you find this post useful. Thanks for reading.